Understanding the U.S.-China relationship through a familial metaphor. The events of the last year have seen a shift in Beijing’s relations with China’s neighboring states and the United States. New Chinese challenges to the international order such as assertions of territorial ownership, pronouncements of international initiatives, military build ups and maneuvering, and land creation in the South China Sea have opened a new chapter in China’s rising power. World governments are rightly concerned as to China’s intentions and newfound prowess. On the positive side, developments such as the recent stock listing proposal to the Singapore Exchange by the company China Jinjiang Environment, Chinese government efforts to clean up polluted rivers, and offers of financial support to United Nations programs offer hope of a responsible stakeholder working inside the international system. The United States welcomes these positive developments but at the same time worries as to the long term outcomes for the U.S.-led international system. What should the United States and Asia-Pacific nations make of these developments? How should they respond? How should China respond to international push-back? How to view the complex and seemingly emotional interactions? As leaders navigate these developments, it is useful to understand the context for the geopolitical situations they find themselves. For China and the United States, it may be helpful to see the relationship using an analogy unfamiliar in diplomacy circles but all too familiar to millions of families, that of the parent-teenager relationship. One may find this idea laughable, but this relationship is no laughing matter. Today the United States finds itself the maintainer of the international order—the parent showing the teenager how to become a thriving adult member of society. In the meantime, China finds itself the up and comer, the teenager trying to establish itself according to its own vision while still needing the involvement of the parent. Indeed, although China is an old civilization, it is a young nation; or more pointedly, a civilization learning to be a nation. For thousands of years, the Middle Kingdom had no peer, only tributary neighbors in East Asia. The European powers brought this “Humpty Dumpty” crashing down in the mid-19th century. This old civilization has since been learning to become a nation, in Western ways and as an equal to its neighbors and other nations. Yet, as Mao Zedong puts it, the “teachers” (the Europeans and the Americans) have not been kind to the students (Chinese); and the learning experience is torturous. The present day U.S. parenting of China goes back to John Foster Dulles, President Dwight Eisenhower’s secretary of state, who advocated the idea of “peaceful evolution” for the “infant” People’s Republic back in the early 1950s. This U.S. agenda met with fierce resistance from the Mao-led Communist Party of China (CPC). Yet it got a new lease on life when the United States helped China get out of its decades-long self-imposed isolation and launch the modernization mission in the 1970s. Since then, the United States has been trying to nurture changes in China, hoping to turn it into a democracy. The post-Mao CPC, however, while engineering China’s modernization and integrating China’s economy and many other things into the U.S.-led international system, has stubbornly continued to resist peaceful evolution, though not in Mao’s big way, and refused to make fundamental changes to China’s political system. Instead, the CPC claims to have found a different way of developing China with Chinese characteristics — a cover for all that is not in line with the U.S. parenting (international standards and norms) — and has turned China into a defiant teenager. Already, this “big kid” is asking for more. In the face of this fast-growing China, the United States has two tough choices. The standard parent response is to stand firm and uphold the rules. A modified alternative is to accommodate at least some of the teenager’s demands. Those who advocate tough stands against China generally take the position that China has no right to practice assertive acts such as demanding unification with Taiwan, refusing to abandon the use of force to achieve unification, developing the A2/AD capability to deter Taiwan and expected U.S. intervention in a China-Taiwan armed conflict, disputing with Japan over the Senkaku Islands, establishing an Air Defense Identification Zone over the East China Sea, making a massive claim on the South China Sea, the recent land reclamation there, and many more. They hold that U.S. engagement policy toward China since President Richard Nixon has been ill-conceived, wrong-headed, and a grave mistake, as it turned China into an 800 lb. 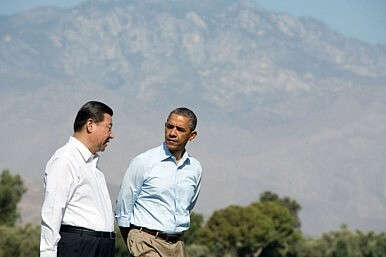 “big kid on the block.” It is high time the United States change course and stop China’s advance everywhere. The “engaging China school,” however, is disappointed that economic development in China has not brought about the expected political change. But the leading advocates insist that the jury is still out on this expectation and believe that change will eventually take place. In the meantime, they acknowledge China’s right to secure its national interests. They appear to see the changing nature of the U.S.-China relations and suggest accommodation as a constructive way to deal with the teenage and assertive China. On balance, confrontation with a defiant teenager often meets with failure and begets more confrontation. Accommodation, however, is difficult to implement. There is no easy way to decide what, where, how, and to what extent to accommodate—is “meeting China halfway” good enough? Without question, the idea that China is like a teenager is simplistic and likely to be dismissed by China. Nonetheless, the familiar challenges of raising a teenager can shed light on the difficult relationship now building between the United States and China. Remembering that neither side wants the relationship to fail and, most importantly, that both sides need each other, will go a long way to ensuring successful negotiations over difficult issues. David Lai, Ph.D. is Research Professor of Asian Security Affairs at the Strategic Studies Institute of the U.S. Army War College. Fred Gellert is Professor of Resource Management at the U.S. Army War College and a retired U.S. Army Colonel. The views expressed in this article are those of the author and do not reflect the official policy or position of the United States Army War College, the United States Army, the Department of Defense, or the United States Government. The ruling may tempt China into a revolt against the U.S.-led international order.